3/99 - NEW DOMAIN SITE! www.dochemp.com Our DENTAL SITE ... www.dochemp.com/badchar.html Our BAD CHARIOTS SITE .... This page plus all our 100+ webpages can be reached from the above two index pages. All updates are on the new domain pages only. These old www.c-zone.net/dochemp/.... pages will remain up for some time till everyone can re-bookmark the new domain pages, thank you. This site is part of & made possible by the B.A.D. CHARIOTS - (Harleys, Racing, Trains, Planes & Automobiles) and Doc Hemp's DENTAL SITE Homepages! So, Please visit Dave & Becky's other 150 urls there too! After visiting this great page of course! Also visit our world class hi-tech Music Room! Our nephew Bob Casebeer Jr. He is in the top 10 or so racers in this sport in the USA = (Bonsi is my term for going as fast down hill as you can = speeds 50 - 60 mph.) I don't know the correct term for these crazy people! Hee-hee! (Crazy like I am too!) Bob's dad Bob Sr. (my bro - in - law) Goes uphill as fast as a human can on a Nitro-Methane full blown Harley Hill Climbing Dragster! His kid goes down hill as fast as a human can on a bicycle ... I Doc Hemp go as fast as I can in any direction, on anything!! Hee-hee again ..... Us speed freaks may not be the sharpest knives in the drawer - but we do KNOW HOW TO CUT A SLICE OUT OF LIFE! 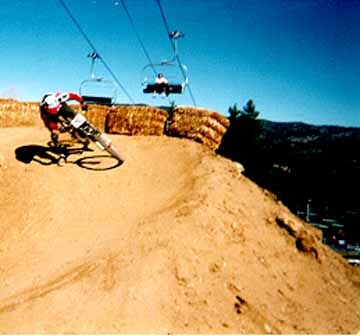 Fall Classic at Big Big Bear Oct 10/11 1997. Race through 6" of snow - Bob place around 7th. 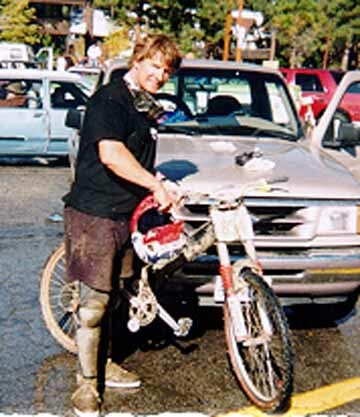 This is Bob jr. with his old bike. 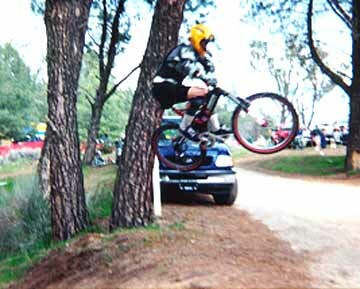 AM Cup 3 - Big Bear - 1997 - still on his old bike. 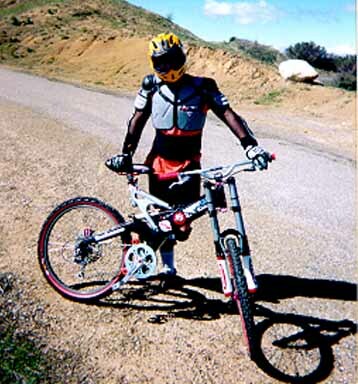 Bob on his new bike at the top of the Santa Barbara Mountains. $7000.00 for a bicycle!! 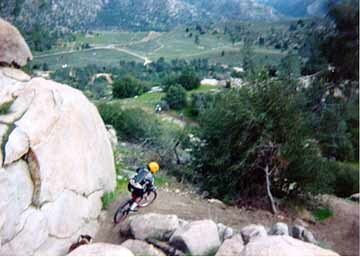 Keyesville Classic 1998 - This is the "Snake Pit" The most extreme part of the course. First race on his new bike. Showing off in the Keyesville Parking Lot. D.H. Gear. Bob was one of the 5 or 6 out of all 400 racers to clear & land this 15-20 ft double at Keyesville. 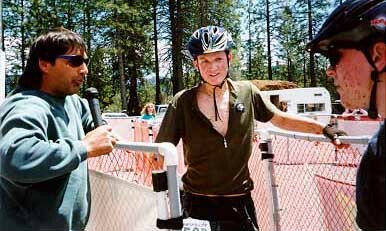 Just before the finish at Keyesville. To read about my Harley ridin pal "THE ICE MAN!" = Thom Brown's Son Tim Brown! 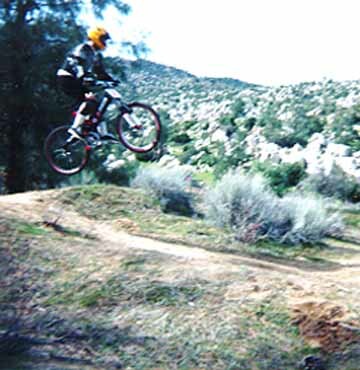 Tim runs in the National Semi Pro division Mountain Bike Races. 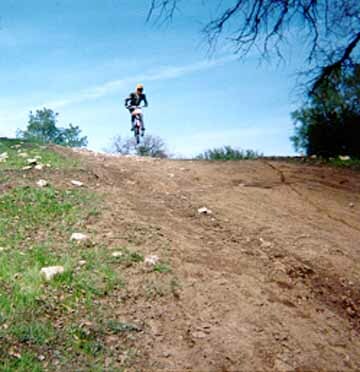 Above is the photo of Tim, winner of the Minnesota race and ranked third so far in the National Semi-Pro Division. You can click on the picture too. 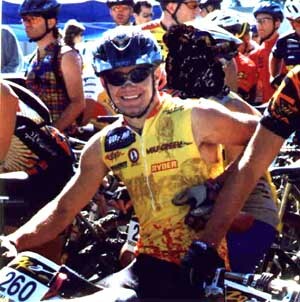 To read about Justin Demallie's first place win - Chevy trucks Wild Rockies Mountain Bike Series. Justin's mom Judy is a long time Hygienist in (our) Doc & Becky Hemp's office.